As a not-for-profit organization, Crane Mountain Valley Horse Rescue, Inc. is funded by charitable donations. Some of these donations come from horse adoptions. All horses have been evaluated by a vet, are up to date on vaccinations, coggins test and dental care. Their hooves are trimmed every six to eight weeks, they are on a regular deworming schedule, are handled daily and have good ground manners. The amount of training varies per horse and the adoption fees are scaled according to training level and ability. The link to download an adoption application can be found at the bottom of this page. Call 518-962-8512 or e-mail horses@cmvhr.org for more information. 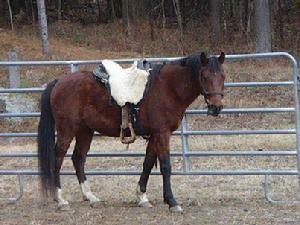 Hawkeye - ADOPTED - Hawkeye is a 15 year old solid paint gelding. He was placed in a home through CMVHR six years ago. He came back to us when his owner was diagnosed with a serious illness that requires full focus on her own wellness. Hawkeye does best with an experienced rider because he prefers to team up with someone for a ride. He likes the partnership. He has great ground manners and is super quiet and gentle. Grey - Grey is an 11 year old, 15.2 hand QH gelding. He was donated by a caring owner because he's just a little too much for the grandkids. Grey is all try with a big heart who prefers a confident rider with patience to let him figure things out first before giving it a whirl. Jillie - Jillie (left) is an 12 year old registered QH mare. She is a financial surrender, meaning her family could no longer afford to keep her. She has great bloodlines and is a super easy keeper. She has not been trained under saddle but easily could be. Should would also make a lovely companion horse because she's sweet, easy going and affectionate. She is a farm favorite for visitors. Bugsy - Bugsy is a 3 year old grade horse. 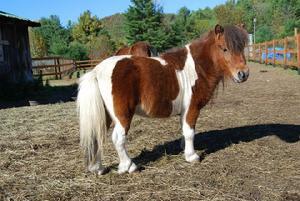 His mother was one of the pregnant mares rescued from a hoarding situation. He was born here at the farm in April 2014. He is tall for his age, standing over 15 hands already. He is refined and a beautiful mover. He's a good boy with great potential. Apollo - Apollo is a 16 year old foundation built QH gelding. He was seized by judicial court order after the death of his owners from a murder-suicide (the man shot his wife and then himself). He's about 15.1 or 15.2 hands. 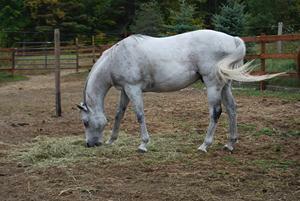 Mommy - Mommy is a 11 year old Morab (Morgan/Arabian) mare who was part of a 41 horse seizure in September 2013. She came to us with her foal George. Both were near death and described as 'living skeletons' or 'fur on bone'. Both have been fully rehabilitated and George has been adopted. She has not been ridden but could easily be trained. She is about 14.2 hands tall and very sweet. Spartacus - ADOPTED - Spartacus is a 12 year old mini gelding who came to us by judicial court order after his owner killed his wife and then himself. KC aka Kool Comet - 2011 registered quarter horse mare. KC's sire is from a line of champion reining horses, and her dam is from champion pleasure horses. She is currently in training. She is super athletic and could be a great barrel or gymkhana prospect. She's an all around solid and good girl with tons of potential. 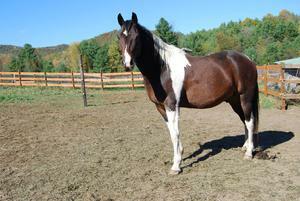 Meko - ADOPTED - Meko is an 8 year old paint gelding. He was seized by judicial court order after the death of his owners from a murder-suicide (the man shot his wife and then himself). He has been brought up to date on vaccinations, deworming, dental and hoof care. He's about 15.1 or 15.2 hands and very sweet. 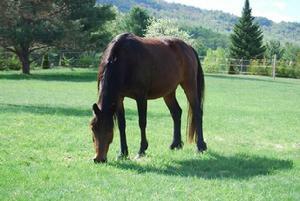 Phoenix - ADOPTED - Phoenix is a 16 year old standardbred. He was seized by judicial court order after the death of his owners from a murder-suicide (the man shot his wife and then himself). He has been brought up to date on vaccinations, deworming, dental and hoof care. He's about 15.2 hands. As a former standardbred racer, he is trained to pull a cart. 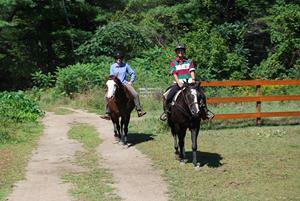 Standardbreds are easy to train to ride since they are used to equipment, bridles, bits and activity. Phoenix is a lover with a very kind disposition. 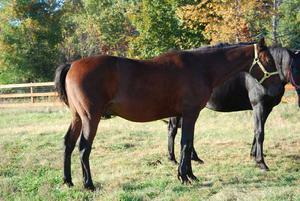 Theia - ADOPTED - Theia is a 15 year old standardbred mare. She was seized by judicial court order after the death of his owners from a murder-suicide (the man shot his wife and then himself). She has been brought up to date on vaccinations, deworming, dental and hoof care. 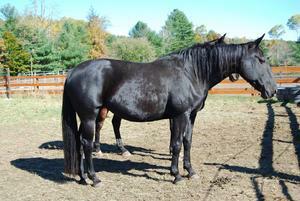 Theia is built like a Percheron cross and is quite tall for a standardbred. She is about 6 hands and solid. As a former standardbred racer, Theia is trained to pull a cart. 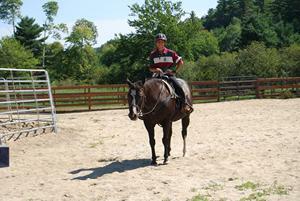 Standardbreds are easy to train to ride since they are used to equipment, bridles, bits and activity. Theia would make someone a wonderful lifetime equine friend. Charlie and Sigmund - ADOPTED - Charlie and Sigmund are former summer camp horses. Every winter for years they would go to one farm together until camp started up again the next year. This year, their winter keeper sold his farm and the camp didn't want them to go to auction so they asked us to take them and find them a new home. 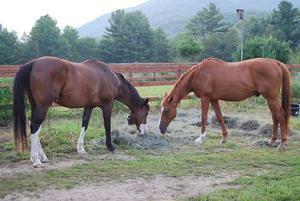 Charlie is a 20 year old paint and Sigmund is a 15 year old off-the-track thoroughbred. As camp horses both are good with kids. Jumper - ADOPTED - Jumper is a 4 year old liver chestnut Morgan gelding. He was seized from a neglect situation and brought to CMVHR for rehabilitation. Jumper is well mannered, affectionate, flashy, and easy to work with and around. He's not yet been trained to ride but is so willing and easy to work with that training will come easily for this boy. He has so much potential to be any type of riding horse. He's athletic and smart. Like all of the horses in our program, Jumper is up to date on all of his vaccinations, hoof care and deworming. George - ADOPTED – George is an 8 month old pinto gelding. His mother is a Morab (Morgan / Arab cross) and his father is a paint. He and his mother were seized from a neglect situation and brought to CMVHR for rehabilitation. He has been weaned from his mother, leads well on a halter, and is good for the farrier and the vet. He willingly wears a blanket, loves to play with his ball, and will even play fetch. He’s smart and willing and will be a great horse. Like all of the horses in our program, George is up to date on all of his vaccinations, hoof care and deworming. He will likely grow to 15 hands or taller and his adoption fee is only $200. Cupcake - ADOPTED – Cupcake is a 7-12 year old liver chestnut Morgan gelding. He was seized from a neglect situation and has been in foster care for rehabilitation and training. He has been backed (ridden) and is still green, but has great potential. He’s smart, athletic and willing. Carob is up to date on all of his vaccinations, hoof care and deworming and his adoption fee has been waived because he is still owned by Essex County and we are serving as adoption agent for the County. Carob - ADOPTED – Carob is a 5 year old Arab gelding. He was seized from a neglect situation and has been in foster care for rehabilitation and training. He has been backed (ridden) and is still green, but has great potential. He’s smart, athletic and willing. Carob is up to date on all of his vaccinations, hoof care and deworming and his adoption fee has been waived because he is still owned by Essex County and we are serving as adoption agent for the County. Biscuit - ADOPTED - Biscuit's registered name is Call Me a Cab. He is a 3 1/2 year old thoroughbred gelding who was donated by a caring breeder who realized after several qualifying races that Biscuit just doesn't want to be a race horse. He asked us to find him someone to love. And what's not to love. He's sweet, quiet, gentle, affectionate, and very sociable. In fact, capturing a picture was tough because he just wanted to follow us around for hugs and kisses. Biscuit is out of I Love New York and Street Cry. His mom is the sister of Friend's Lake (Kentucky Derby contender) and he's the 1/2 brother to Zenyatta (2010 Horse of the Year). He's been incredibly well cared for and loved. He just does not want to run fast. If you are the one for Biscuit to love, give us call or send us an e-mail. 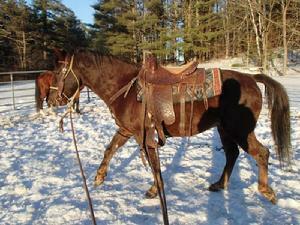 Bear - ADOPTED - Bear is a 16 year old registered quarter horse gelding. He is formally trained as an event and dressage horse and has had a very successful showing career, in addition to being a great trail horse. He has been much loved. His young owner was finding student loans and board in a resort community too much and asked us to find Bear a new, forever home. Bear comes with a custom saddle, bridle, blankets, shipping boots, exercise boots, halters and more. Like all of our horses, he's up to date on vaccinations, worming, dental and hoof care. He's got a great disposition and enjoys working. 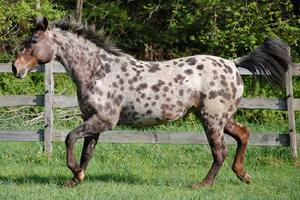 Sabrina - ADOPTED - Sabrina is a 15 year old leopard appaloosa mare. She's been ridden english in the ring and on the trails. We have been lunging her, but haven't had a chance to get up on her yet due to weather and time. She knows all her commands on the ground, on or off the lunge line, and enjoys working. She joins up nicely, is very smart, and affectionate. Appaloosas, by nature, prefer that one-on-one relationship with someone special. Sabrina is no exception and is a really wonderful girl. We have a no breeding policy. Hita - ADOPTED - Hita is an 18 year old Colonial Spanish mustang. She is about 15.1 hands tall, and one of only 3,000 of her genetically unique breed left in the world. Colonial Spanish horses are known for their versatility, intelligence, and natural beauty. Hita is no exception. She is trained under saddle and has been ridden, but she is a little timid and would do best with someone who has time to spend with her or as a companion horse. Adoption donation: $100. Silver - ADOPTED- - Silver is a cremelo gelding. He is about 18 years old and rides English and Western. He was rescued from slaughter, is about 15 hands, and an easy keeper. He loves to wear a Santa hat at Christmas time and pose for the camera. Adoption fee: $500. Mazy - ADOPTED - Mazy is an 8 year old, dapple grey mare. She is 15.2-15.3 hands, absolutely gorgeous, healthy and sound. She is affectionate, people-oriented, and good with other horses. She has great potential for the show ring or the trails. Adoption fee: $500. Pocketful of Posies - Poesy is a 21 year old Trakehener mare. Poesy suffered a stroke in the summer of 2009. Fast action by our local veterinarian, along with Poesy's heart and strong will, saved her. She now suffers from seizure disorder and arthritis. She is not available for adoption and will live out her days with us until the quality of her life leads us to the very difficult decision to let her go over the rainbow bridge. 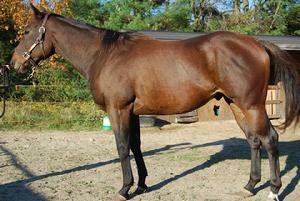 Pelham Bay - Pelham is an older warmblood cross, former grand champion event horse. He came to our farm in 2002 when his owner was diagnosed with AIDS and could no longer care for him. Pelham has navicular changes as a result of years of competitive jumping and wears corrective shoes. Pelham is one of our program horses and is not available for adoption. He is the star for our education and outreach programs with children, adults and those with special needs. In 2005, Pelham entered the show ring after a 4-year "vacation" with one of our youth volunteers aboard. 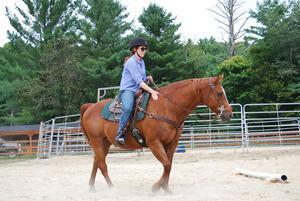 She began working with Pelham two years prior when she was just 6 years old, learning basic horse care and discovering her naturally, gifted riding skills. The two of them were Champions in the Essex County fair that year. In 2010, she took him to summer camp for two weeks. He loves to be fussed over and really enjoys his job here at the farm. Jed and Buttons - ADOPTED. Jed and Buttons are in desperate need of a home and it would be great if they could be placed together. Their young owner was tragically killed in an automobile accident and the family asked for our help placing them. Currently, a neighbor is caring for them. They are located in Vermont. Please call 518-962-8512 or e-mail horses@cmvhr.org if you are interested or willing to help them. Just Letitgo Louie - ADOPTED - "Louie" is a 6 year old, unraced thoroughbred gelding who was donated by a caring breeder when his racing times were determined to be too slow for racing success. He has a very sweet disposition and enjoys working. He's very willing and easy going. Louie is 16.2 hands and has potential for anything: dressage, the show ring, or the trails. He is currently being ridden by an instructor who is teaching lessons aboard him, riding side-by-side with the young woman she is teaching. Louie is sound and healthy and ready to go. Adoption fee: $800.